Climbing Zucchini 'Black Forest' F1 Hybrid. Photo Courtesy of Thompson & Morgan, Inc.
Zucchini 'Black Forest' F1 Hybrid is not a miniature plant by any means. 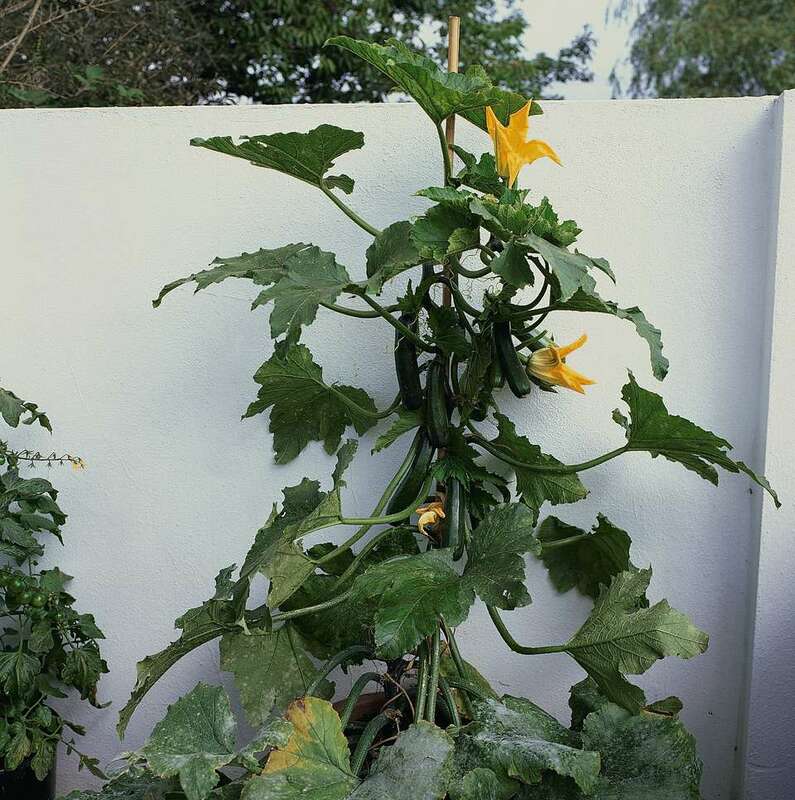 However, unlike most zucchini plants, it doesn’t bush out at the base, so it can easily be contained in a large pot (at least 24") and trained up a stake or trellis. ‘Black Forest’ actually does better in containers than in the garden, because it favors a very rich, well-drained soil and that can be better controlled in a container. The vines produce medium-sized zucchini, about 6 inches (15 cm) in length, with flavor comparable to normal bush zucchini. ‘Black Forest’ can begin producing earlier than garden zucchini, because the seeds can be started indoors, 3-4 weeks before the last frost date. Since they are being grown in a pot, there’s no problem with transplanting. Sowing in April or early May should have you harvesting in July. Sow seeds about 3/4 inch deep (19mm), either directly in the container where they will grow or in 3-inch pots for transplanting. Water well and keep the soil moist, but not wet. Keep pots at about 68-77 degrees F (20-25 C) until germination, which should be in about 5 - 9 days. If you’ve started the seeds in small pots, transplant to their final container when they develop their first set of true leaves. Gradually harden off the seedlings before leaving them outdoors. Thin plants to 24". There will probably be 1-2 plants per container. Place container where it will be in full sun and water regularly, whenever the soil feels dry. Feed with any fertilizer labeled for use on edible plants. Plants growing in containers need full strength, regular feedings because watering can flush nutrients out of the pot. As with any zucchini, the more you pick, the more zucchini the plants will produce. You may find ‘Black Forest’ zucchini listed as a Courgette, which is just another term for zucchini.